Drag Bunch is a rockin' time! Shangela La Quifa Wadley emcees the show. Coco Montrese and Yara Sofia also grace the stage. 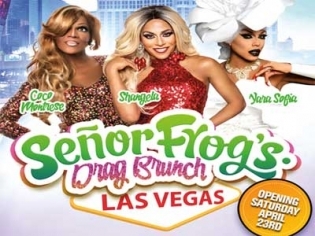 Wigs, costumes, Glamazons, unlimited Mimosas, comedy, dancing and more are what you will experience at Treasure Island’s Drag Brunch at Senor Frog’s. Maybe you didn’t even make it to bed the night before, or maybe this is your “Where I Woke Up in Vegas” story, but either way you will have a story to tell! Bring an appetite and a few dollar bills, but leave your inhibitions at home. Shangela La Quifa Wadley emcees the show and Coco Montrese and Yara Sofia also grace the stage. Opt for the VIP package with the open bar, but if you get a bit out of control you may find yourself part of the show! The buffet includes pancakes, French toast, waffles, taquitos, beef sliders, fajitas, burritos, hash browns, bacon and sausage.